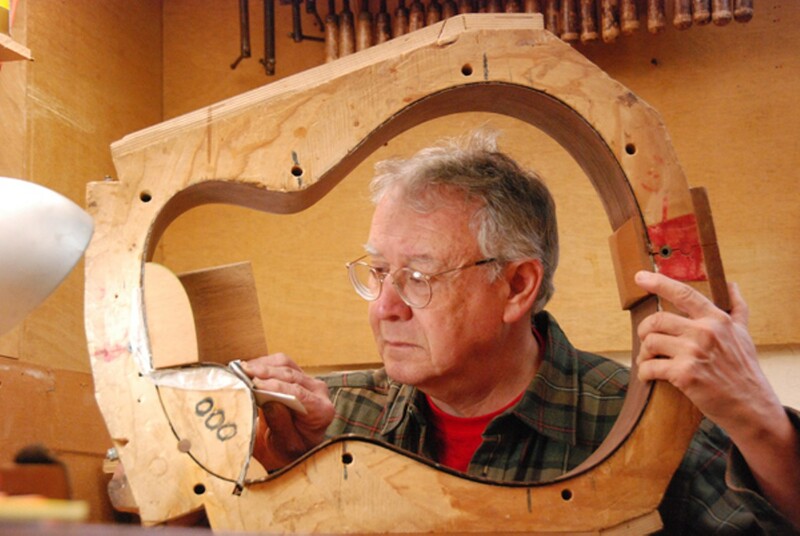 In the early Seventies, Ervin Somogyi found his calling making steel-string acoustic guitars — and produces some of the finest in the world to this day. 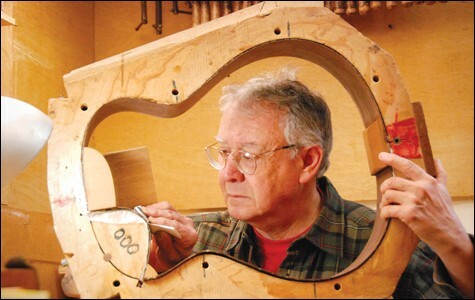 Ervin Somogyi began making guitars after reading the book Classical Guitar Construction by Irving Sloane. One of the world's best guitar-makers, Ervin Somogyi, is carving a little piece of wood in his Oakland workshop. He's been fussing with it all afternoon, shaping it into a device known as a bridge, which anchors strings and transmits their energy to the guitar body. The bridge is a relatively minor aspect of a guitar, but it definitely matters in the overall scheme of things, said Somogyi (pronounced suh-MA-jee): "Every element matters. They all deserve my best effort." He explained his goal is to create an instrument that transcends "excellent" and enters the realm of "exquisite." Somogyi often devotes eight hours to creating a great-looking bridge. By contrast, a big guitar factory in China might spend five minutes on the piece. But there's a price for Somogyi's diligence. A good guitar from China might cost $500 (for example, an Epiphone Masterbilt); an excellent Martin D-28 built in Pennsylvania (the type used by Paul McCartney on "Blackbird") might cost $2,000 to $3,000; Somogyi charges $30,000. Working in his Temescal district shop, he creates exactly one handmade, steel-string acoustic guitar per month, twelve annually (he doesn't take vacations), exactly 456 since he started in the early Seventies. Some have said Somogyi is the world's greatest guitar-builder. "There's no question he's in the top ten," said Paul Heumiller of Dream Guitars, a respected shop in Weaverville, North Carolina, in a phone interview. No matter his ranking, all agree Somogyi played a pivotal role in advancing the art of handmade guitars. At age 69, Somogyi is small and unpretentious. His jeans are baggy and dusty, with extra pockets for tools and pencils. He's got a healthy ego, which he tries to hide, but which comes through in conversation. When the topic of Japan came up, he said, "I'm very well regarded in Japan," with a slight emphasis on "very." That's as close as he comes to boasting. He does not elaborate. He does not mention that Japan venerates fine woodworking and gives its respect in this field to very few outsiders. There's a shop in Tokyo called Blue-G where you can buy Somogyi's guitars. For three million yen. Somogyi was born in Hungary in 1944. He said his father was a "brutal authoritarian." Both parents were "very damaged" and "quite depressed," not least because several members of the extended family died in the Holocaust. As a child, Somogyi generated distance between himself and the world's bleakness by retreating to his room and building plastic models — cars, airplanes, ships, wagons, tanks, a Roman chariot. The family moved to America in 1959 when Somogyi was fifteen. His parents demanded he pursue a medical degree; this effort collapsed during his senior year at UC Berkeley, and he graduated in 1966 with an English degree. He joined The Peace Corps and served in Peru, which he loved. Returning to the Bay Area in 1968, he dabbled in graduate school, held odd jobs, poked around, and sought his true path. In 1970, he came upon the book Classical Guitar Construction by Irving Sloane, one of the clearest guides to guitar-making, which was published in 1966. Before Sloane, wrote Barbara Stewart in The New York Times, "Anyone interested in guitar construction had to find a luthier [an expert craftsman of stringed instruments] — usually in Spain, Germany or Belgium — and try to become his apprentice." Somogyi read Sloane's book and said he thought to himself, "I can make a guitar!" He liked guitar music (he was, and is, an accomplished player), he liked working with his hands, and he had plenty of free time. "And," he added, "there was no one to stop me." He bought tools at flea markets and labored with great deliberation for one year in his apartment in Oakland — sawing, gluing, clamping, bending, filing, sanding, shaping, worrying, exulting. When the instrument was finished in 1971, he played a rousing flamenco number and started on his second guitar. He sold the first one for $200. His first few guitars were nylon-stringed instruments for classical players. He soon found himself drawn to the construction of steel-string guitars, a descendent of the classical guitar, but used by a wide range of artists in folk and rock, and finger-picking virtuosos such as Alex De Grassi and Leo Kottke. The steel-string crowd — players and builders — was "more easy-going than the classical people. Not as uptight," Somogyi said. Somogyi's big break came when he established a relationship with artists on the record label Windham Hill, founded in 1976 in Palo Alto, a pioneer in making high-quality recordings of solo, instrumental guitar music. Windham Hill's early artists weren't satisfied with the quality of sound they were getting in the studio, until they discovered Somogyi's guitars and lined up to buy them. Somogyi's work with Windham Hill was part of a revolution in guitar construction that is still unfolding today. "We've seen some remarkable change, for the better, in a relatively short period of time," said George Gruhn of Gruhn Guitars in Nashville. For the first half of the 20th century and through the Sixties, two great companies dominated the high-end, acoustic steel-string market — Martin and Gibson. Martins from the Thirties and early Forties are especially admired. When McCartney wanted a new acoustic in 1968, he took delivery on a Martin D-28, a state-of-the-art instrument. McCartney still plays his. Starting in the late Sixties and early Seventies, influenced by the Sloane book and the explosion of singer-songwriter-driven guitar music, dozens of people, mostly Americans, began building handmade, steel-string acoustic guitars. The best of these instruments, including Somogyi's, sounded quite a bit better than McCartney's D-28. How much better? Considering how much more open, expressive, warm, balanced, complex, and haunting they sounded, maybe 20 percent better. Maybe more. The difference, perhaps, between excellent and exquisite (to use Somogyi's words). Since the Eighties, the handmade guitar community has expanded dramatically. Today, hundreds of artisans world-wide create handmade, custom-designed guitars, including Michihiro Matsuda in Oakland and Jeff Traugott in Santa Cruz, both of whom rank with Somogyi at the very top of the profession. They generally sell directly to their customers; used models occasionally show up at premier dealerships such as Blue Note Music in Berkeley. Guitar fairs, like The Healdsburg Guitar Festival, held this year on August 9-11, feature the wares of top builders, including Somogyi. "We're living in the golden age of luthiere," said Heumiller. "And Ervin Somogyi is at the center of it." Somogyi acknowledged he's proud, of course with his signature humility. "It's been satisfying," he said. "Working with my hands. Creating, thinking, planning. Solving problems. I like the job. On most days, I'm quite happy." The eighty-foot-tall redwood at the late naturalist’s historic home in the East Bay has a fatal disease. But an arborist has figured out a way to save its heritage.